Today I took my daughter and her bestie to Boston for an appointment I had, and then we shopped a little bit on one of the best streets in New England, in my opinion - Newbury Street. It always reminds me of what Holly Golightly said in Breakfast at Tiffany's, where nothing can go wrong there because it is such a lovely place. Newbury Street is my Tiffany's (and has a Tiffany's as a matter of fact). 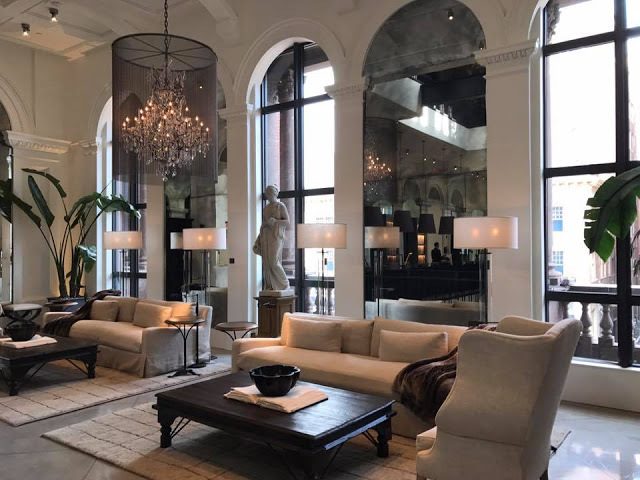 My favorite store in Boston is on this street - the Restoration Hardware flagship store. Locals will know it is in the old Louis Boston building and is four floors of design heaven. It's so worth it to visit in you are ever in Boston, even if just for the new design ideas!